You are here: Home / Fun Activities For Kids (By Age) / Activities For Elementary School Kids / What is static electricity? Ugh! Socks sticking to my t-shirt! When I run across the carpet, I shock my friends! Mom, what is this?? This goes back to basic science! Remember that everything is made up of atoms and atoms have 3 parts to them “ neutrons, protons, and electrons. Protons and neutrons are at the center of an atom, together they make up the nucleus (remember our atom model for kids). Electrons circle the nucleus. Of the three, electrons are easier to “lose” because the force that binds them to the atom's nuclei is weaker than the other two. When you rub 2 objects together, the electrons mix. Negatively-charged electrons, or an object that is negatively charged, will attach itself or bring a positively charged object to itself – that is static electricity. Neat, right? When something gains an imbalance of electrons (more or less than the number of protons in an atom) there is an attraction as the negative charged object draws other electrons from other atoms, in other objects to itself. Blow up a balloon and rub it against your head. Watch the hair stand up on end. It is especially fun to see on lighter toddler hair! Turn on the sink faucet so that the water runs in a small, steady stream. Rub the balloon on your head a few times, then move it near the water. Watch what happens to the stream of water “ does it bend away from the balloon without being touched? Blow up a second balloon and tie the end of it to a string. Tape the end of the string to a center of the doorway, so that the balloon hangs down. 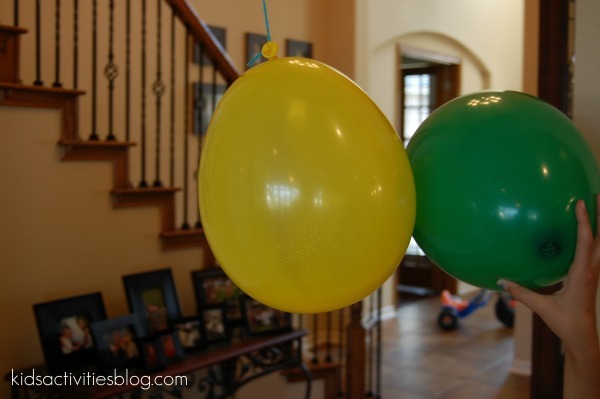 Rub the first balloon on your head again, then slowly move it toward the one that is hanging in the door. What happens? Did the hanging balloon move away? Place an empty soda can on it's side on a flat surface like a table or smooth floor. Rub the balloon ion your head a few times, then hold the balloon close to the can without actually touching the can. What happened to the can? Did it roll away? 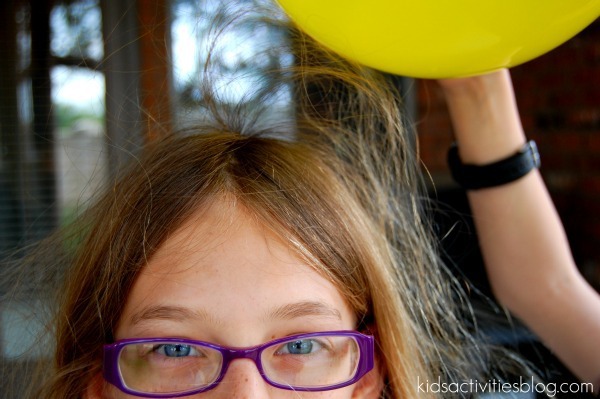 How is Static Electricity Working? When you rub the balloon on your head, the balloon pulls electrons from your hair. 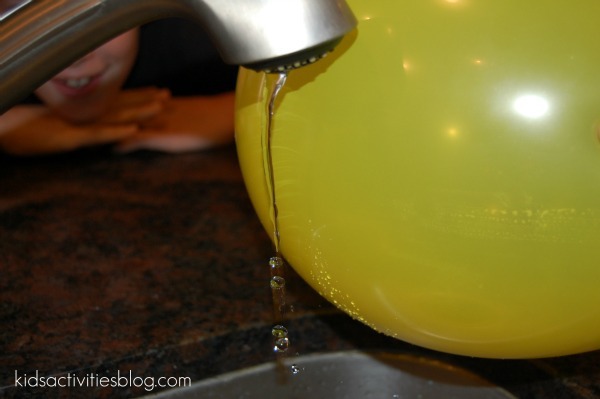 The negatively charged balloon then attracts the positively charged objects, such as your hair, the other balloon, the soda can, even running water! Like this experiment? Check out our experiment on Magnetic Dollars, how the ink in the US dollar reacts to magnets. Previous Post: « Hurry ~ Free Dominos Artisan Pizza to First 25,000! What fun! JDaniel would love to see the can roll! My kids still think it’s fun to rub balloons on their hair and watch it get all staticky and stand up straight! Fun way to learn, that’s for sure! My kids will love this! This is science fun in action. Visiting from the Hop! YAY! I’m so glad that everyone enjoyed this post – my kids LOVED to play with the balloons and totally gobbled up the learning behind it! So fun! Thanks for all your comments! This would be a fun activity to do with our playschool children!